There have been many well-publicized cases of invasive species of plants and animals, often introduced unintentionally but sometimes on purpose, causing widespread ecological havoc. Examples of such alien invasions include pernicious weeds such as Japanese knotweed, an introduced garden ornamental which can grow through concrete, the water hyacinth which has choked tropical waterways, and many introduced animals which have out-competed and displaced local fauna. 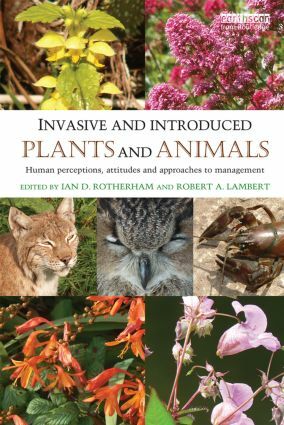 This book addresses the broader context of invasive and exotic species, in terms of the perceived threats and environmental concerns which surround alien species and ecological invasions. As a result of unprecedented scales of environmental change, combined with rapid globalisation, the mixing of cultures and diversity, and fears over biosecurity and bioterrorism, the known impacts of particular invasions have been catastrophic. However, as several chapters show, reactions to some exotic species, and the justifications for interventions in certain situations, including biological control by introduced natural enemies, rest uncomfortably with social reactions to ethnic cleansing and persecution perpetrated across the globe. The role of democracy in deciding and determining environmental policy is another emerging issue. In an increasingly multicultural society this raises huge questions of ethics and choice. At the same time, in order to redress major ecological losses, the science of reintroduction of native species has also come to the fore, and is widely accepted by many in nature conservation. However, with questions of where and when, and with what species or even species analogues, reintroductions are acceptable, the topic is hotly debated. Again, it is shown that many decisions are based on values and perceptions rather than objective science. Including a wide range of case studies from around the world, his book raises critical issues to stimulate a much wider debate. Nativeness and Nationhood: What Species ‘Belong’ in Post-devolution Scotland? The Rise and Fall of Japanese Knotweed? The Paradox of Invasive Species in Ecological Restoration: Do Restorationists Worry about Them Too Much or Too Little?